On May 6 & 7, 2015, the U.S. Chamber of Commerce Foundation, in partnership with The Ellen MacArthur Foundation, hosted the 2015 Sustainability Forum. The event joined influential leaders and thinkers, from different business, government and nonprofit organizations from around the world, to explore the impact of the circular economy on businesses. Through a series of insightful keynotes, panel discussions, and interactive workshops, the forum was also an opportunity for participants to examine current business strategies and how to achieve greater cost savings as well as advances in Cradle to Cradle® inspired design. 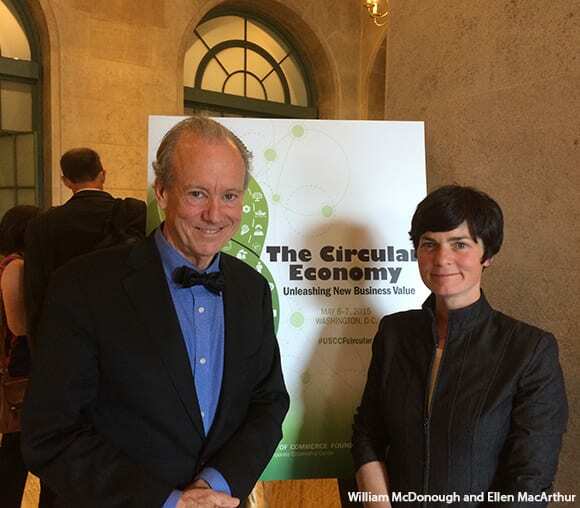 William McDonough delivered the closing keynote, ending day 1 of the event. In a recent discussion with Joel Makower of GreenBiz, part of the The McDonough Conversations series, McDonough reveals circular economy as one of the major themes of the 2015 World Economic Forum in Davos. Cradle to Cradle® and the circular economy have gradually become mainstream after several years. For more details on the U.S. Chamber of Commerce Foundation’s 2015 Sustainability Forum, visit the event page.